Miss R and I recently spent an afternoon working on her Valentines cards. 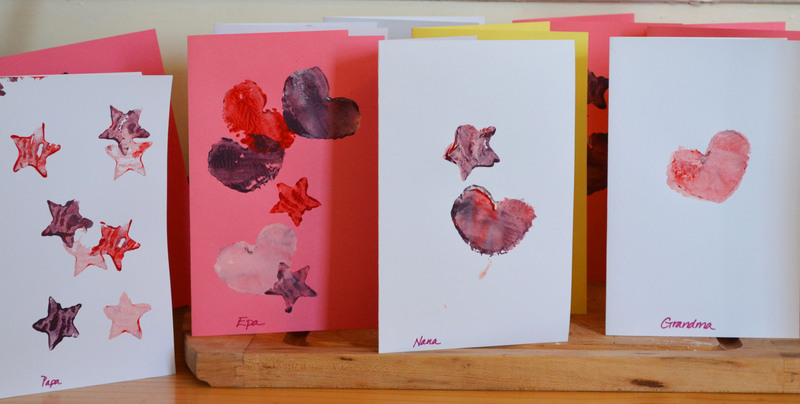 She loves anything to do with paint, so I made this set of potato stamps for her and let her have her way with a trio of red, pink, and purple paint. By the time she was done the stamps had sort of a tie dyed effect that she liked. 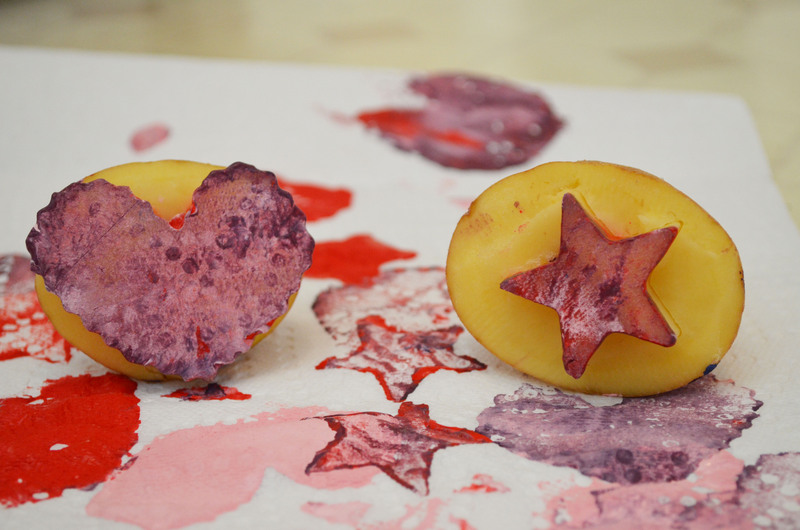 Potato stamps are easy to make and easy for little hands to hold. We used one large yellow potato and basic craft paint. Pick out one or two smallish cookie cutters and a potato a little wider than the width of your cookie cutters. Cut the potato in half width-wise. Push the cookie cutter into the potato half, going about 1/2″ deep. (I put the cookie cutter on the counter and then pressed the potato half onto it so the pressure was even.) Don’t pull the cutter out yet! With a paring knife, cut into the potato 1/2″ down from the first cut and carve away the potato flesh around the cookie cutter. Once you’ve finished with that, carefully pull (or wiggle) off the cookie cutter. Blot on a paper towel, and then stamp away! There are more Valentines projects going on around here, in various states of completion. 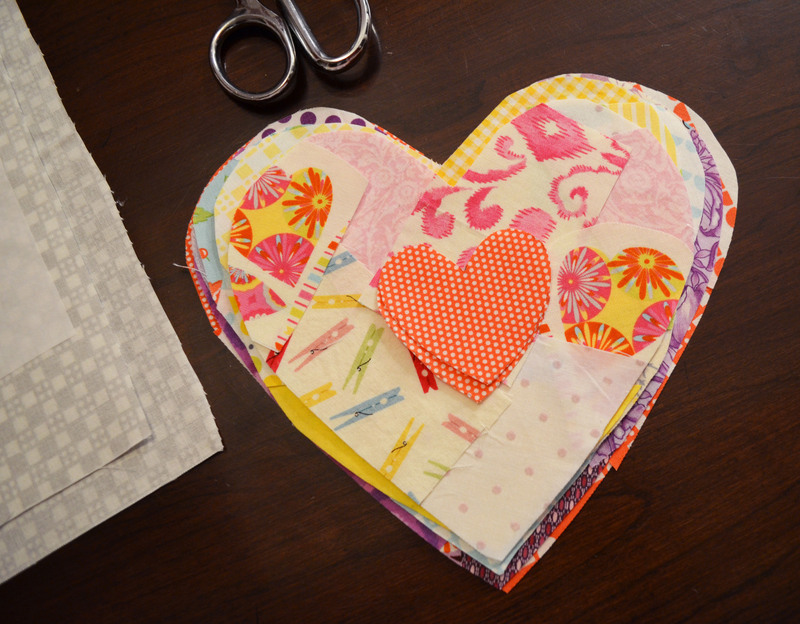 I’m working on some scrappy hearts and will post more photos as they come together. What are you making for Valentine’s Day? How fun! What kind of paint do you use?